MOUNTAIN VIEW, CA — April 1, 2011 — Something just wasn’t right. For months, the scientists at the direct-to-consumer genetic testing company puzzled over anomalies in the customer data they were analyzing as part of their ongoing research efforts. None of the usual statistical or methodological explanations fit the results they were seeing. Then, someone came up with a crazy idea. It was so bizarre that at first no one else would take it seriously. 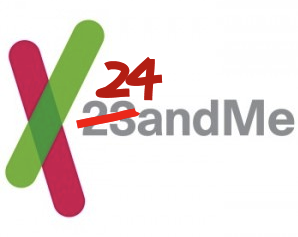 But when the evidence was presented, the conclusion was clear: 23andMe would have to change its name, because humans actually have 24 pairs of chromosomes. Their findings, published today in Genetics in Practice, show how even the most established ideas — such as humans having 23 pairs of chromosomes — can get turned on their heads. The researchers are calling their discovery “chromosome 23” after the [original] name of their company, which, in a convenient stroke of luck, was also the next logical number in the human chromosome naming hierarchy. An imaging method modified from a technique commonly used for visualizing chromosomes — called “fluorescent in situ hybridization, yoked”, or FISHY — confirmed the physical existence of the new chromosome, as shown in the figures below. Perhaps more exciting than the discovery of “chromosome 23” is evidence that it may account for most, if not all, of the so-called “missing heritability” of complex traits and diseases. (When we asked other scientists about this concept, no one could really tell us what the missing heritability is, but everyone seemed to be trying to find it!) The researchers’ data indicated that polymorphisms on this unique chromosome explain nearly all of the genetic variability for a variety of complex traits, in contrast to other recently proposed theories.